Salzburg, serenissima: The view on the Old Town or Altstadt of Salzburg should not require any words to describe it. The picture was taken from the Mönchsberg Hill, which is covered in roads and paths that can easily be hiked on. There are several look-outs at the Mönchsberg from where you get a direct view on Salzburg's city centre. 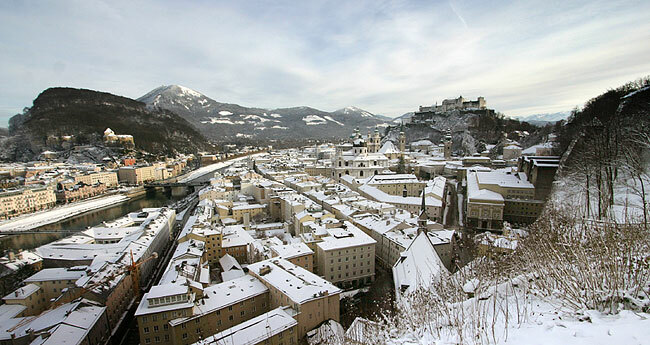 This panorama view, taken on a very winterly day in December, includes most of the Altstadt, a UNESCO World Heritage Site, as well as the most important hills of Salzburg: Kapuzinerberg, Gaisberg (with a white cover in the background), Festungsberg (the one with the Salzburg Castle or Festung Hohensalzburg on top) and Mönchsberg (as mentioned before).